Two years ago, the world was plunged into a dark hole called the recession and massive financial collapse. Two years later, even bigger public funding and drains on taxpayers managed to stifle the deterioration of the fundamentals of capitalism (which turns out to be "speculation"). But, stifling was not enough, and the world is once again facing a return to the 30s when everything collapsed. The BBC has just reported a finding by the Securities Exchange Commission in the US that 10 of the major Credit Rating Agencies showed that these agencies had suffered fundamental ethical breakdown. The report showed that these agencies did not make timely credit reports nor did they even try to resolve conflicts of interest. For me, this is the disgusting side of capitalism: unethical behaviour. 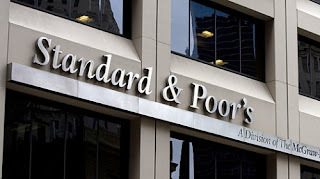 The world's economy are already based on pure speculation, but market confidence is now found to be based on ratings issued by corrupt and unprofessional agencies - which includes Standard & Poor's and Moody's. I reckon we should start a drive to shut these agencies down. There is no need for them, especially if they are practicing their trade in such an unbelievably unethical manner. Instead of fretting over the banks and corporations with bailout funds and the inevitable payment terms, just hand down some well deserved justice to these agencies and seize whatever assets they have to reinject into the economy.